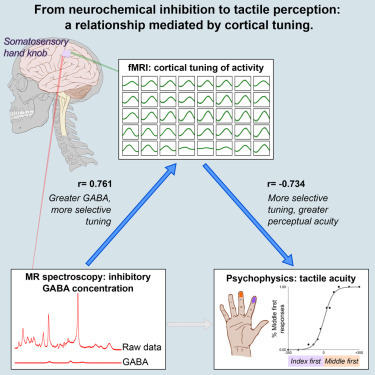 We are pleased to announce the publication of a recent paper by Dr. James Kolasinski, investigating the mechanistic role of GABA in tuning of activity in the primary sensory cortices. James has been on a Junior Research Fellowship connected to the Plasticity Group having done his DPhil at FMRIB, co-supervised by Heidi Johansen-Berg and Charlie Stagg. He has now taken up a Henry Wellcome Fellowship at CUBRIC. This paper: "A Mechanistic Link from GABA to Cortical Architecture and Perception" is published in the journal Current Biology, and is available online here. Congratulations to James, and his fellow co-authors: John Logan, Emily Hinson, Dan Manners, Amir Divanbeighi Zand, Tamar Makin, Uzay Emir and Charlie Stagg.